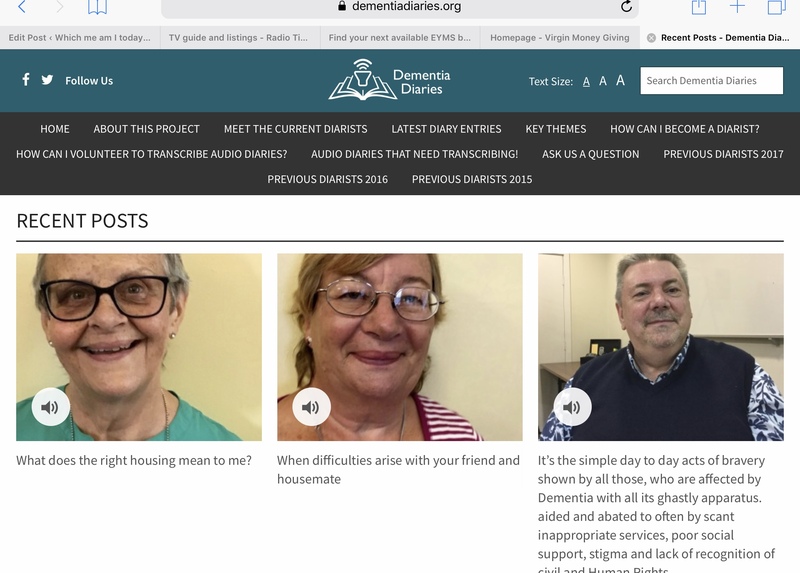 Dementia Diaries recordings…….. | Which me am I today? For those who havn’t found or heard of Dementia Diaries. It’s a web site where people with dementia, including me and all my playmates, record our opinions or feelings about anything and everything. But I know it’s me, it’s my voice. So here it is if you’d like to listen to my way of remaining in my own home, which I call my ‘haven’ and the adaptions I’ve made. We’re always looking for people to transcribe our ramblings. They’re only short and there are detailed instructions on the web site. Lovely people from all over the world have transcribed for us but we’re always looking for more. If you’re interested just click on ‘How can I volunteer to transcribe diaries’ on the black strip at the top of the page. Such useful comments, Wendy. They are not only insights into how someone with dementia might perceive things but also good tips for me on things that I can do to make things easier for my mother. Keep up the good work – you are providing a really useful service! Hello I’m Lynne and at 50 was diagnosed with early dementia . I have a husband and 3 girls . Now 17 14 and 12 . I was l (let go ) from the Itu at Matre when i was 48 and was treated with antidepressants . I had been at the docs since 2013 saying i couldnt concentrate at work but was always told it was depression . It was only after i had a total brekdown they finally listened and tested me to find dementia at 50. My husband now works so hard to try and support us but it really isnt enough and all our savings are dwindling . I get no help as no formal diagnosis has yet been confirmed . I have to wait till febuary to see a neurologist for that . I can still drive and take the kids to school but i can’t multitask as i forget what i was just doing before so i can no longer work in the nursing profession . I try and have the best life i can for the kids but at times i feel so inept inside . I make them aII laugh but they dont see the tears i weep . I dont know my future but hope i will never forget my lovely family. I loose my things all the time now never knowing where I’ve left them. My kids are good at finding things for me now. I feel too young to be in this position and it cost me my job before anybody decided to listen so i was never able to take early retirement like so many others i have read . I wlould love to hear from any other people who are in my position if there are any more as i feel very alone at times and would love to hear from you .